Tomorrow on Monday there is chance to see some interesting presentations on Micronations and global economics. Among the presenters is Georg Zoche from Transnational Republic, who will introduce his new book Weld Macht Geld. The book documents the events that took place in Bretton Woods conference, focusing on the not widely known fact that United Stated used some dirty tricks to establish US dollar as the key world currency. The book also explains an alternative proposal formulated by Keynes which was based on creating a new global currency. These topics are very relevant today, since after the crash there has been talk about a need for a Bretton Woods type of conference and a shift for a new global currency... And here in Finland we just got the news that Finland should lend 1.7 billion euro for Greece, as a part of the efforts of European Union to save the economy of Greece (and the euro currency) from sinking. This will definitely cause some heated debate here during next weeks, and hopefully people will be motivated to learn a bit more about global currencies. More information below and at www.ykon.org. YKON welcomes you to an evening introducing the preliminary plans for the Summit of Micronations and Utopian thinkers, which will take place at Brioni Islands (Croatia) in 2013. The evening includes presentations of the co-organisers of the Summit: Drugo More and Electra. 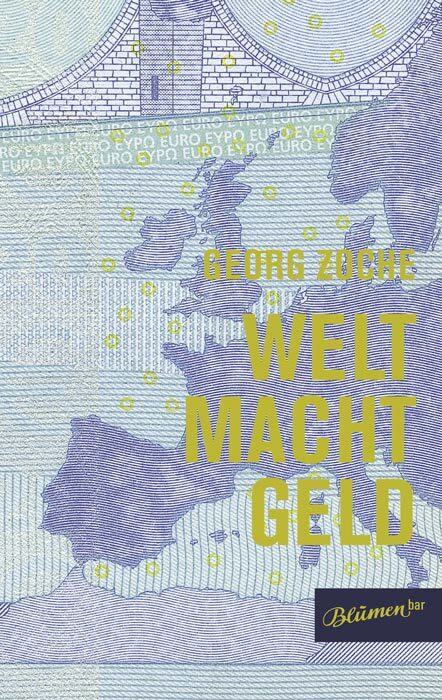 Special guest Georg Zoche - co-founder of Transnational Republic - will present his latest book "WORLD-POWER-MONEY" tackling the systemic relationship between currencies, political power, war and crisis. Zoche furthermore offers a perspective on the question: What could replace the US-dollar after its apparent decline as world key currency? YKON is an artist-run non-profit advocacy group for experimental countries and utopian thinkers. YKON evolved from the First Summit of Micronations" produced by Artists' Association MUU. The current members are Ulu Braun, Zeynep Falay - von Flittner, Sasha Huber, Tellervo Kalleinen, Oliver Kochta-Kalleinen, Pekko Koskinen and Tomas Ivan Träskman. YKON is currently also developing a contemporary version of Buckminster Fuller's World Game. Drugo more is a non profit organisation based in Rijeka, Croatia. Founded in 1999, Drugo More integrates art, culture, theory and policy actions in the local context of the Adriatic region. The organization develops alternative visions and models for the cultural development of the region. Electra is a London based contemporary art agency established in 2003, which specializes in curating, commissioning and producing ambitious cross-disciplinary projects. Electra curated Momentum 2009, 5th Nordic Biennial of Contemporary Art 'Favoured Nations' and commissioned numerous works, for example Reverse Karaoke, a project by Kim Gordon and Jutta Koether. Lina Dzuverovic is the co-founder and Director of Electra. Formerly Lina was New Media Curator at London's ICA; prior to this she worked for The Wire magazine, Mute magazine and The Lux Centre. Irene Revell works as curator and producer at Electra. Previously she worked and volunteered for small music charities Share Music and COMA (Contemporary Music-Making for Amateurs), and has a background in the DIY music scene, promoting gigs and festivals such as the Bring Yourself Fest. The Transnational Republic is a political grassroots experiment to establish a democratic system of citizen representation within globalization. It was founded in 1996. Transnational Republic took part as delegates to the First Summit of Micronations in Helsinki 2003. * 1944, during the Bretton Woods conference, the US clandestinely changed the wording of the conference documents, thus rendering the US-dollar world key currency and the US world super power. When Great Britain called foul and protested against this fraud, it was coerced by the USA under enormous pressure to the ratification of the agreement. * During the past six decades, the USA took advantage of the privileged role of their currency, financing their political interests e.g. the wars in Vietnam and Iraq by externalising their costs on the rest of the world. * To finance the war in Iraq, the Federal Reserve deliberately chose the hazardous gamble of fueling a housing boom thereby pushing the world into the biggest financial crisis of all times. But Zoche not only explains the coherence between war and crisis, illuminating where and how the money disappeared. His book also offers a perspective on the question that is now coming to the forefront: What could replace the US-dollar after its apparent decline as world key currency? Reading about the British plan which was defeated in 1944, even die-hard economists will be flabbergasted: Keynes had envisioned a world economy free of interest, with a new global currency based on barter (instead of credit), thereby maintaining the equilibrium between the nation states.